While it’s important to generate an interest surrounding literature among children, it’s even more important to do it in an engaging way. Pune based Ketaki Latkar is working towards doing just that. Latkar is a communicator and has been working as a journalist for more than a decade. 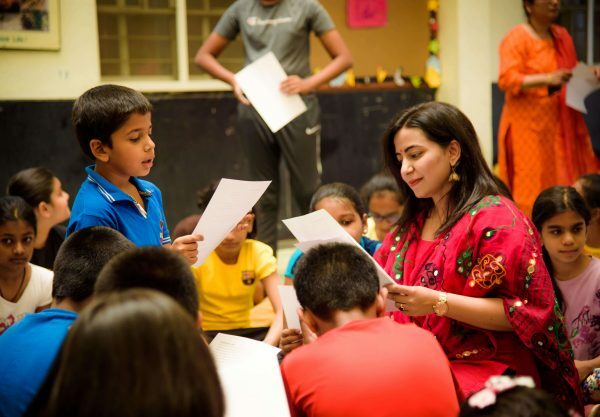 As the Chief Facilitator and Founder of the startup – The Wordsmiths Club (TWC), her vision lies in enhancing the English language skills of children in school. Ketaki also teaches a module on Soft Skills to postgraduate students of Savitribai Phule Pune University’s Department of Law. 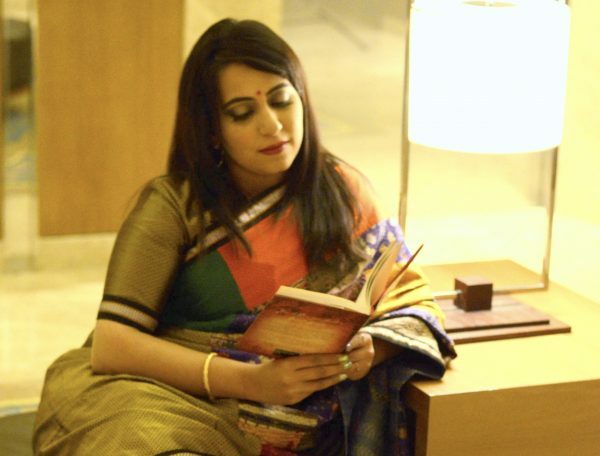 In September 2018, she released her graphic book ‘Raising Rihaan’ at the Pune International Literary Festival. SheThePeople.TV spoke with Ketaki Latkar about The Wordsmiths Club, her book, the importance of literature and more. Please tell us about The Wordsmiths Club and its vision? What drove you to start it? I always had a flair for writing, and was also a rather enthusiastic orator since childhood. During my graduation days at Fergusson College, I used to voluntarily visit my school Abhinava Vidyalaya and spend time with children – reading out books to them, or discussing authors, or helping them out with elocution competitions, and so on. These stints, however, were unstructured and pretty informal. Subsequently, I got busy with studies, and later with work, and slowly, the visits to the school came to a halt. Later, I became part of the print media industry and for a long time, I was working as an education reporter. That was when I started visiting many schools in the city. During these visits, and after multiple interactions with the teachers, parents and education facilitators, I realised that the condition of language education, especially English, in most of the schools, was abysmal. Children knew nothing outside their textbooks, and unfortunately, most of the schools were not going that extra mile to acquaint students with literature, public speaking and reading. As a writer, and a language enthusiast, I felt terrible about the situation, and that is where the idea of planning a positive intervention started. Nonetheless, it was not practically possible to spearhead any initiative, at that point in time. I had a very consuming job, and the idea of bringing about change was still crystallising in my mind. I kept mulling over it, and finally, three years back, after I left my full-time job, I decided that it was time to put together my experience of working with children, and the love for English together. And that’s how The Wordsmiths Club (TWC) came to life. What are the factors that you consider when it comes to enhancing language skills for achieving exceptional performance? I often come across parents, who complain that their children don’t read as much. They want me to help them improve their child’s reading skills; at times, they insist their child shies away from speaking, which they need to be corrected. However, I think this is a fundamentally wrong approach at assessing your child’s linguistic ability. You cannot isolate a part of language learning from the other equally essential parts, which means: I cannot work only towards improving a child’s writing skills, without focusing on the reading, listening and speaking skills. All these aspects are intertwined, and development of each of these is equally important. At TWC, the focus is on language enhancement in a holistic sense. What are the different modules that you teach under the aegis of TWC? While conducting these courses, what are the major areas that you cater to? There are three modules (for different clusters of grades: 5-6, 7-8, and 9-10) that I teach at different schools in Pune. In addition, I also conduct short-term, and weekend workshops, as also one-to-one sessions for children, and adults. I do not teach anything from the academic syllabi. The idea behind designing these courses is to present a slice of literature to kids, and take them on a literary adventure. Secondly, the course contents are all-encompassing and include lessons in all the four essential aspects of language learning: reading, writing, speaking and listening. The methods of teaching are interactive and play-way, with a view to ensure that there is no element of rote learning. The contents differ for every module, but the common thread is the exposure to outstanding literature, authors, and poetry. Right from Roald Dahl, to Charles Dickens, Ruskin Bond, Sudha Murty, Arthur Conan Doyle, Oscar Wilde, Jane Austen, and Rudyard Kipling, and so on, the modules explore different authors and poets, and their exemplary works. Apart from authors and books, topics like poetry appreciation, character sketches, experiential writing, letters, reports, travel tales, weaving stories, paraphrasing, and public speaking, are also explored. You’ve grown up in Pune, and coming from a family of litterateurs and educationists, you’re familiar with the situation of language studies for quite some time. Now that you are also working in the same space, are there any transitions you have noticed of late, in terms of participation and interest among students? Well, in terms of interest, I think, children today are very keen on learning, and they also realise the value of studying languages. I think this is quite a remarkable transition, given that back in the day language studies always played second fiddle to the more “lucrative” math and science preferences. This stereotype has reasonably gone down, and people have realised how critical communication and interpersonal skills are. Children nowadays are also much more in sync with the happenings around them, thanks to social media. That not just helps them in accessing information, but they also form informed opinions and that’s praiseworthy. Speaking about the flip side of the present-day situation, I feel school-going children, in this day and age, are painfully over-scheduled. They are so busy attending a series of classes, they barely get any downtime. Not having time to do nothing and simply get bored is healthy, and also sparks creativity. This seems to be missing a lot, and that’s not good news. If you’re given the responsibility, what is it that one thing you would like to change or introduce across schools in India? I have come to realise that in most of the schools, the library period is more of a dull, programmed affair. The drill is absolutely drab: children go to the library, they are presented with only a few choices of titles, and they need to quickly (and pretty much, with not much thought) pick one of the books, and get going. The entire experience is usually uninspired. I believe having a dedicated time slot for reading is, in itself, such a beautiful concept. Schools can ideally make the experience so palatable for kids that reading will become a way of life. Children need to be informed about different authors, new titles, great poets, and literary trivia during the library session. And most importantly, the librarian needs to know every nook and corner of the library, and also its collection in and out. An invested and passion-driven librarian can work wonders for students. Given a chance, I would love to revamp the libraries at schools. What led you to write Raising Rihaan? Tell us about the book. Raising Rihaan has been the consequence of my observations about children, whom I interact with a lot as part of TWC’s sessions. For me, teaching does not remain confined to merely completing a certain module in the classroom and going home; there’s a lot of conversation and free-wheeling communication that happens between me and the kids. Thanks to these interactions, I started to note down little anecdotes and pieces of information that they shared; those were almost like revelations to me about modern-day parenting and the “first world” issues of not just children in the present times, but also their millennial parents. These notes were funny, but they were not trivial. Before I knew, I had already collected a sizeable amount of observations and musings. That is when I thought of turning them into a book, and that is how Raising Rihaan was conceptualised. The concept and the contents of the book are mine, and the illustrations have been done by the visual artist Annushka Hardikar. 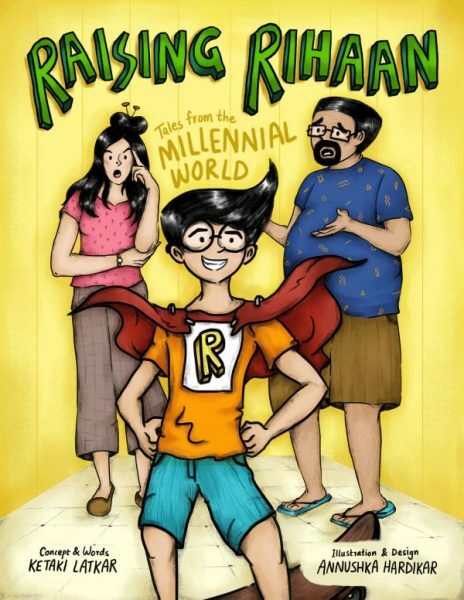 The book revolves around the “I-know-it-all,” smart cookie Rihaan, who is a 12-year-old adolescent of the present times. Rihaan may be your nephew, your neighbour, your son, or your friend’s little one – he is around, and you definitely know him. The graphic stories speak volumes about themes, such as the impact of social media and technology on our lives, the changing family dynamics in modern households, and lack of free time for kids, and so on: these issues are the biggest concerns of today, which make the book relevant and relatable. What is your advice to those children who are on their way to explore unconventional paths? Also, I think, more than conventional or unconventional, it is a lot about finding happiness and conviction in the choices you make.